Either use hover effects to create aesthetic effects or to give extra functionality for your web shop, there always are some fantastic ways to do it. If you want that Internet Explorer also recognize these effects, you must use some hacks. This can be done easily with jQuery, for example. 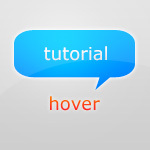 If you need to use only valid XHTML and CSS code, hover effects can be brought out by using anchor tags (<a></a>).